At the last minute on Sunday, my Dad (who is visiting from Seattle) and I scored tickets to the 2009 NBA All Star Game, which amazingly took place in my current residence of Phoenix, Arizona. I have been to several professional basketball games in the past, including three separate Michael Jordan games (another story for another time), but no games since the late 90’s, and nothing as star-studded as an All Star Game. w00t! The NBA has changed a tremendous amount in the past 15 years with the dominant players being Lebron, Kobe, and still Shaq, who is now on Twitter. Anyone who follows Shaq knows how much of a goofy, fun guy he is. 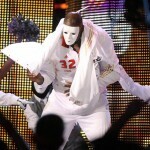 During his intro, Shaq put on one of the funniest dances I have ever seen. I also took a bunch of video with my Flip Mino HD which I will be posting shortly. What an incredibly fun experience! UPDATE: Video I took with my Flip Mino HD of awesome SHAQ DUNK!!!!! I have been to football (soccer) matches before but never basketball. I wounder what the acoustics are like in the indoor arena. I just love the sound of crowds. I wish I was there because it sounds it was really exciting. Flip Mono HD impressed me with the quality of the video. Oww first link died before I saw it. Always known shaq to do the crazy stuff. Hell I used to play his shaq-fu game on SNES. The other video, considering that you took is from a distance is pretty good! The 1st clip has been removed, which is quite annoying, but the second slam dunk one is way cool! Hang in there man! Absolutely no question about the entertainment value. Must have been worth every minute of your time there seeing the action live! That was pretty funny … Shaq is multi-talented … dancing, Twitter, b-ball, and rap? Bad luck due to violation not seen first video, great work done in second video…. It looks like you had a lot of fun. It’s too bad that the video won’t play anymore! Gutted, the videos have been removed. Next time I should be here quicker! Interested in hearing your Michael Jordon stories. I have seen him play many times including some of the play off games in ‘nosebleed standing room’. We were so high that we got nose bleeds, but it was still great. Gotta love Shaq and his love of the game. I want to see it live and i like his last movements. Very interesting video i am so excited to see last movement of match. If you are a fan of this funniest theme, you are sure to remember these ever-popular moments! If not, you can review these moments on YouTube. Shaq is not just a basketball player he’s an entertainer. @Custom street cars i said that before the videos removed anyone have it to upload it again ? The AllStar game must’ve been a blast. The NBA has really stepped up and turned the sport into great entertainment. Other leagues like the NHL are taking notes and trying to catch up. I think Shaq is getting a little carried away with his dancing though. Did you see how he started doing the bowling choreography with his teammates before games? With the way he was making his teammates purposely fall to the ground, it’s surprising that none of them got injured. I’m sure the coach would’ve been pissed if that happened. Looks you had great fun time @ nba even we enjoyed video you been more fun there. It was pure exciting entertainment, some of the video very exciting. want some more videos. That is why Shaq is such an huge star. Really an innovative kind of guy if you ever meet him. Great video man! Shaq is a huge star, but his comments about Stan Van Gundy (Magic coach) were petty, out of line, and pretty cruel. I have no idea why Shaq felt the need to say what he did, but it only made himself look bad. I wish Shaq still made movies, it is really a treat to watch him try to act. I enjoyed this video, lol. Woah that was awesome! I haven’t laughed that much in the long time. My cooworkers are now looking weird at me. Very funny video. I like it and i enjoyed it. I will follow to Shaq in twitter. Thanks. Funny video. Shaq can dance? lol. Thanks for sharing this. Basketball games are always a good time. Haha they are almost as fun as soccer games. The shaq dunk was really sweet btw.